What Folks are Saying - Don't Be a Cow! The illustrations were so right on with words. This book is so George and Rachel. The interactive daily game exercises really will make you think. Plus, though probably not the music I would create for my own list (I’m more of a musical theatre guy), it’s pretty easy to call up the songs online and take a listen. I started to read it day by day then found myself jumping around to other parts of the book and other day exercises. I think most people have pretty much experienced many of these – and the format was easy-to-read. Definitely something to consider giving to that petulant teen or young adult who is “finding him or her self.” (And some adults … 🙂 The website also has some good daily blog posts. … and it has helped me to remember some of the things that I really have taken for granted. Illustrations are great and the daily exercises are fun. I ended up buying 10 copies for some of my co-workers and they all said they really have enjoyed reading it. Several have even passed it on to their teenage children! A very good read! … as it enables you to think about your own outlook on life as well as how to see the world in a different way. — And it’s an easy read! I love your book, you guys did a great job! I love the lay out and how your message is presented. The book is very inspirational and uplifting. Well done! I loved going through the game exercises and really felt like I was moving myself into a more light-hearted and carefree person. I know that I’ll return to it over and over for more inspiration and self-reflection. … through the use of game exercises. It causes you to pause and to think about what’s important to you. It’s fun and light-hearted and the kind of book that you can return to again and again for personal inspiration and reference. 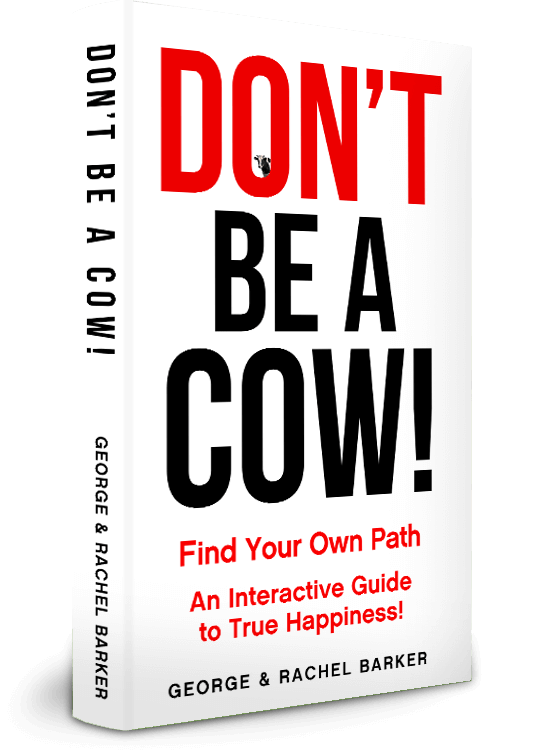 I recently received a copy of Don’t Be A Cow! as a gift from a colleague who thought my intermediate schooler and I might enjoy reading it together. The first thing I noticed was the presence of interactive and interpretive elements: short scripts, thought provoking writing prompts, empty frames for creative expression, and similar elements. When I began to read through it, one chapter spoke directly to the conversation about my child’s literature assignment from earlier in the week, about meeting the challenges of growing up. As a former middle and high school teacher, I’d love to have used this book in my classes to help teens and tweens make sense of their world and the relationships in it. The ability to overcome a herd mentality with humor and love is priceless at any age in live. This book reminds me that what’s in our heart still matters. So don’t be a cow … take the leap. You might just jump over the moon when these life lessons are shared.